Going to the beach or the pool just isn't the same without Beach Balls! With bright and classic designs, this beach ball assortment will add some flair to your next poolside celebration. They're also a great solution if you're looking for cheap luau decoration ideas or hosting a big Hawaiian party. 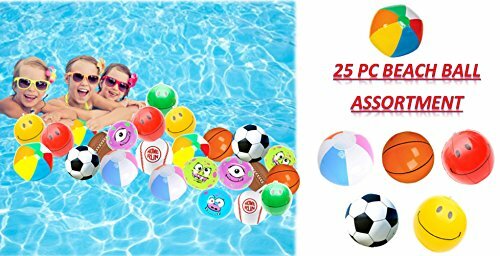 Get several of these inflatable balls for beach party games, prizes or giveaways. EVERYONE WILL HAVE A BALL at your luau party, beach party or poolside gathering when you toss in our Beach Ball Assortment! Each vinyl ball is approx. 6 inches and printed with an individual pattern to add some flair and variety to your party decorations. Fill your pool with beach balls and watch your guests dive into the fun! After the celebration, hand these funky beach balls out as party favors. If you have any questions about this product by Play Kreative, contact us by completing and submitting the form below. If you are looking for a specif part number, please include it with your message.